﻿ Hueston Woods State Park Campground - Ohio. Find It Here. Hueston Woods State Park, located in Butler and Preble counties, has nearly 3,000 acres of outdoor recreation, such as hiking, fishing, canoeing, and unique to this region -- fossil hunting. The park surrounds 625-acre Acton Lake, with campsites, cabins, and a resort lodge. Over 200 electric campsites with showerhouses, flush toilets, laundry and trailer waste station. Over 100 non-electric sites with vault-type latrines. Equestrian camp area offers 20 electric and 29 non-electric sites. Riding arena is available for practice or horse shows. Group camp areas for youth and adult organizations are available for reservation. Pets are permitted on any site.Free WiFi access is available at the camp store to registered campers. Unique getaway: One yurt is also available for reservation. Resort lodge in the park has a full-service restaurant. Boating, golf course, archery range, disc golf, dog park, fishing, swimming beach, hunting, many hiking trails, 20-mile mountain biking trail. Nature center and naturalist programs. The 625-acre Acton Lake is open to boats of any motor size, but speed is restricted to no wake. One launch ramp provides access to the lake. The park offers boat rentals, 168 docks and fuel during the boating season. 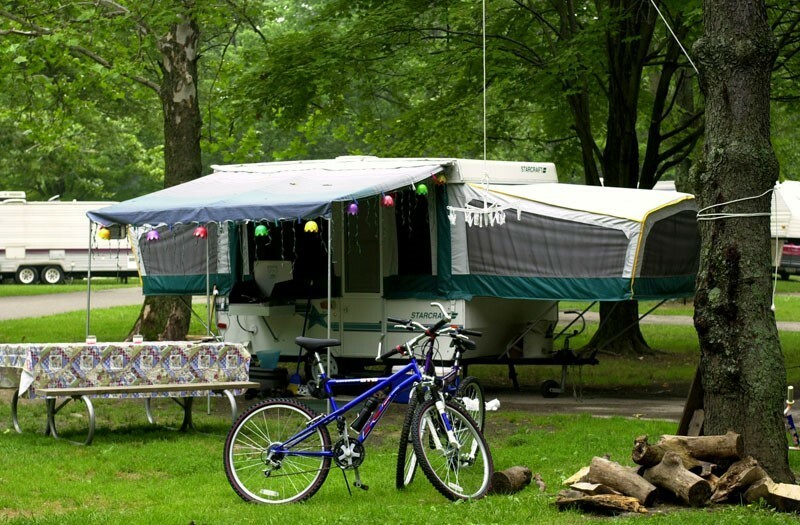 Electric, non-electric, group and equestrian campsites. Pet friendly. Wifi at camp store.